Downtown Los Angeles Rainfall Drops Below 50% of Normal. What are the Chances of a March Miracle? 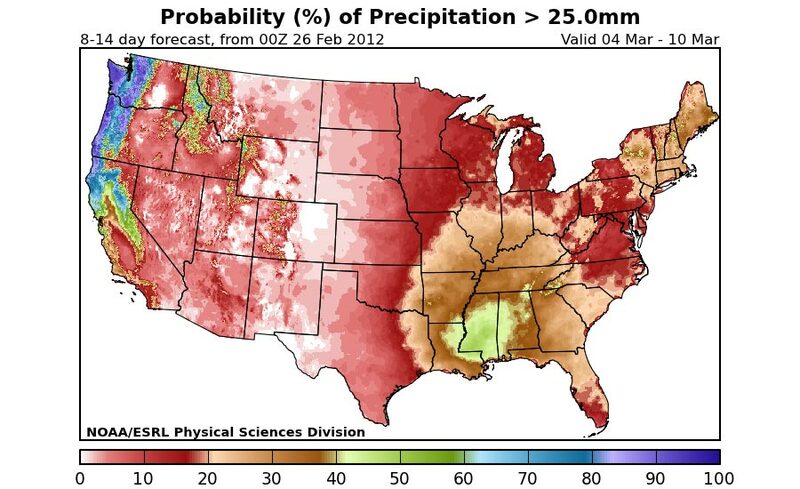 Probability of more than 25mm precipitation from 03/04/12 to 03/10/12. Wednesday Downtown Los Angeles' water year rainfall total fell below 50% of normal for the date. With only 5.22 inches of rain in the bucket it looks like we're headed toward the driest rain season since the record-setting dry water year of 2006-2007, when a meager 3.21 inches was recorded. If Los Angeles ends the rain year (June 30) with less than 7.16 inches of precipitation, the 2011-2012 water year would be one of the ten driest on record. It's been dry throughout most of Southern California and much of the state. According to data compiled by the NWS Burbank's water year total now stands at a paltry 34% of normal; Long Beach 49% of normal; Camarillo 42% of normal; Santa Barbara 56% of normal; and Paso Robles 49% of normal. Southernmost California has fared a little better with San Diego at about 79% of normal for the date. Central California rainfall is also well below average with San Francisco at 35% of the normal, San Jose at 26% and Sacramento at 40%. I received an email recently from a reader asking if I thought a March Miracle was likely this year. Keeping in mind the chaotic nature of weather, and that low probability events do sometimes occur, the short answer is that I don't think it's likely we'll see higher than normal rainfall this March. 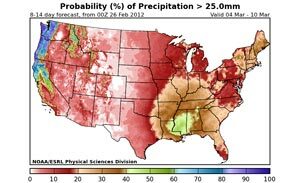 In a post in early October I discussed what the impact of a second year La Nina might be on 2011-12 Winter precipitation in the continental U.S. For a selection of seven second year La Ninas the coastal Southern California climate division recorded about 5 to 6 inches less precipitation than normal for the period November through March. If we take a look at March rainfall in that same selection of second year La Ninas, four of the seven recorded less than 0.5 inch rain in March, and only one was well above average -- 4.83 inches in March 1975. Current outlooks are not favorable for higher than average March precipitation. The Climate Prediction Centers 6-10 Day Precipitation Outlook, 8-14 Day Precipitation Outlook, and One Month Precipitation Outlook all indicate below normal precipitation in Southern California. 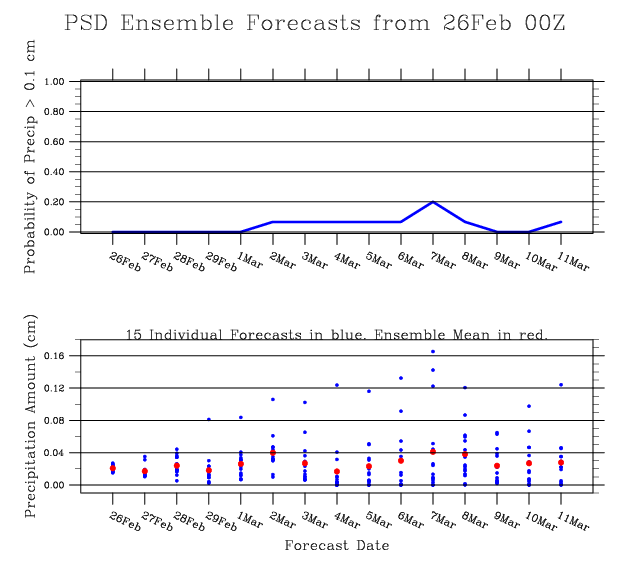 The ESRL/PSD Analog Probabilistic Precipitation Forecast is also dry in the 6-10 and 8-14 day outlook period, and the PSD Ensemble Spread does not look encouraging. On the climate side of things the active phase of the MJO has been stalled in the Indian Ocean, but the 15-day ensemble ECMWF and several models forecast increased amplitude and eastward propagation. As a result of strong negative East Asian and Tropical torque events, relative atmospheric angular momentum is dropping like a rock, with the GWO taking a big dive into La Nina territory. Should the MJO continue to propagate and AAM increase over the next 2 weeks, perhaps we'll see the scenario necessary to generate an extended Pacific jet strong enough to impact the West Coast. Monday its looking like we may get a little rain and possibly some lower elevation snow. Goes soundings and model data indicate the Pacific system is moisture-starved, but it is quite cold and is forecast to have strong dynamics. A GOES sounding near the systems core showed a 500mb temp of -30°C. Precipitable water values in the circulation around the low were around 0.6 inch. With such cold air aloft, and strong system dynamics, strong convection is a possibility. We'll see!